Jessica and Hai, a globetrotting Australian couple and writer/photographer team currently based in Tokyo, document their adventures with words and images. The home page is a dynamic display of the vibrant images of the festivals and places they’ve explored and is a fun way to share their content. Two friends under the aliases Naomi and Elle approach weight loss, body image, exercise, and women’s health with heart, humor, and sass. The conversational blog is new, but the pair has created various features, like static pages for exercise journals and stats, so readers can follow along on their journeys. A group of romance novelist-moms muse on motherhood and writing, from the craft to the business of publishing. An honest, lighthearted tone permeates the blog—they share what they have learned about raising kids and writing books with readers, yet also learn from each other. Ten friends explore a mix of topics, including travel, family, and food. Their voices are different, yet they share a perspective that life should be shown as it is: beautiful, messy, mundane, and real. The photography is the blog’s unifying element. Through this simple but effective photo project, a dad and daughter get to know each other—and their cameras—better. Each week, they share images based on a theme. 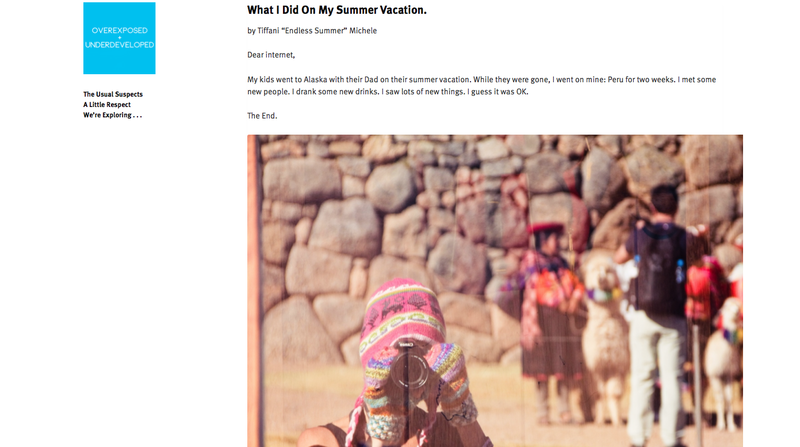 The side-by-side placement of their photographs and clean blog design are a winning combination. This group of writers analyzes cultural, social, and political trends in the Iranian, Central Asian, and Diaspora communities. Three columns of text and images offer a variety of content, and authors and categories are clearly displayed. This is what happens when a trio of engineers decide to take to the streets and document what they see. Stunning shots of culture, nature, and people are showcased on a photo-centric home page with a custom image sidebar. This team covers exhibitions and cool finds in art, design, and music, from London to Tokyo. Influenced by both contemporary and traditional culture and design, they post in English and Japanese, attracting a global readership. Have an idea for a group blog? Create a new blog or transform your current one by following the steps in the support document on inviting blog contributors. I wouldn’t use this since my blog is a solo-blog, but this is great for blogs with multiple writers! Reblogged this on Tubagus Arief Z art. Awesome! I’m glad this has sparked interest in creating a group blog. Yeah that is cool…. I am looking forward on the group blog… It’s going to be fun…. So great Cheri, thank you! I’m an academic by day, and for 3-1/2 years now I’ve been running a mostly solo blog on reality and identity in this virtual century of ours. I decided not to travel this summer and have taken the whole break, which ends next week, to focus on building that “blog” into a “virtual salon.” We now have about a dozen “primary authors” and another dozen guest authors. It’s been a project seeking out strong and diverse voices for our somewhat unusual and eclectic topic, but here we are in August and I really think our virtual salon is an exciting and vibrant place of ideas and interaction far beyond anything we’d imagined even as recently as the beginning of June. i prefer solo but this collaborative works is awesome ! Having a group blog has taken the stress out of blogging for me, since I don’t have to do all the posts myself. Plus I get to see how other authors see things and catch up on their research and travels. We use The Morning After and it’s worked well for us! It’s a great idea. I would love to incorporate this into my daily contest blog. I’ll just have to look at the examples and see what would be a good way to do this type of co-authorship. Hi. I kept wondering if WordPress ever had such a feature to encourage group blogging…but it seems it really does now. I will try the feature on a new blog and see how it works and whether I like it and whether my poet friends would think its cool or not. Thanks for sharing this. Great use of linking to all of the other blogs! Some of the group/ duo blogs seem really interesting and I’m sure the use of multiple writing styles really makes things exciting. Although I am having a great time writing my current blog solo, I may have to search out some fellow bloggers with similar passions to whip up a new blog with in the future. My blogging partner are collaborating on a blog for missing and expoited children. We have a belief that through the power of people, WordPress, and once click that children’s faces and details regarding the event can be seen by millions of eyes that no other media can touch. We are just going on 4 weeks old and we are creating a following that reblog every alert. That is the premise used that we believe will create apositive impact on this world wide epidemic. We also include tips, suggestions, and advice on eeping our children safe, believeing we are a village and it’s up to each of us. We have a group blog. It is a fiction blog and four of us each write posts for one of the main characters. We joke that it is like being in a band because we play off each other’s posts and story lines. My friends and I have a fiction blog. Four of us write posts for the four main characters and we joke that it is like being in a band because we are inspired by, and play upon what each other writes. Yes myself and friend have done a joint venture in the helping of missing kids, it called Bring Them Home…. As a blogging newbie, I found this article helpful. Thank you for posting! Reblogged this on Bebeg's Blog. Wow, this is great! Just saw these cool themes and they’re awesome! This is quite useful. Thanks for the insight. Reblogged this on We Am Are. Reblogged this on K Riana Rahma K.
Reblogged this on Super Junior FIGHTING!!. I just started a school blog with my 8th graders, everyone has an individual blog, and they blog about all kinds of stuff, from cats to fashion, from music to movies, from sports to flying. Hmmm…never thought of having guest bloggers. I wonder if that would work for my 3 blogs. OR — maybe . . . I could rent space on one. Yeah, be a literary landlady. Hey, it could work. Great post! I was just in the process of adding some authors to my site, so the timing is absolutely perfect. The resources available today to get your voice and your passions out are unprecedented. Wow, thank you so much for telling people about our blog. We’re super excited about it. Sure thing. I’ve enjoyed the beginning of your journey so far! I have to agree from my experiences running a group blog that it’s a very rewarding experience. It really helps to make the blog a more well-rounded thing rather than an exclusive solo voice. Thanks for this. Just taking tiny World Press blog steps at the moment. So useful to know. I work in a library, and our librarians have basically made our internal book club a sort of “public” thing, which allows us to talk books with our customers in a new, asymetric way. It gets about 150 visits a day, which is gratifying. It also lets us see that people are interested in all kinds of odd little things, so they don’t all read blockbusters. We did a presentation at WordCamp GC about how to use your blog in the same way, and I’d encourage other librarians to think about it. Our notes are here: http://gcbooks.wordpress.com/events-for-readers/wordcamp-gold-coast-2011/ and we’re happy to help out colleagues who are a bit stuck with how to make it all fit together. THis sounds absolutely amazing! I would love to do this kind of thing with textiles or fashion. The possibilities are endless. Many thanks for featuring our blog in this post! We are really excited to be able to share our experiences with more of the blogging community and to check out the other collaborative works on your list! So many inspiring ideas! Thanks so much to everyone who has visited our site, liked and followed. Much appreciated and looking forward to sharing more travel stories soon! This weekend, we’ll be climbing Mt. Fuji so stay tuned for updates! Jessica — there’s always something fun and interesting to see when I visit your blog. 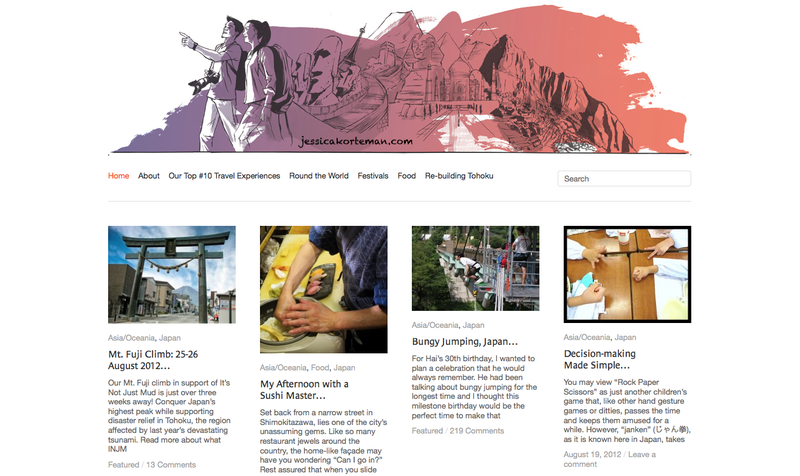 Your theme works great, and I love the images on the home page that give a glimpse into each post in a visual way. Have fun on your Mt. Fuji adventure! Many thanks to WordPress for featuring our site in their recent blog post about group blogs! Read what they had to say about jessicakorteman.com and check out the other collaborations for some inspiring ideas! Thank you to all of you who have visited our blog, liked posts, commented, followed and shared our site with your readers and friends. It’s very much appreciated and we look forward to continuing this dialogue and bringing you many more travel stories and photos to come! Is there a limit to the number of writers in the group? One feature I would also find really helpful for our group blog is a better scheduling interface that allows us to view our posts in a calendar format. This would more easily help us catch days where we might have accidentally scheduled two posts, or days that we need to fill. It would also allow us to schedule our vacation posts or putlace holder drafts for special day posts far in advance without cluttering up the Posts list with a whole page of scheduled posts before the next day’s post that we need to edit. Recently started a team blog. It’s an interesting experience. My regular blog is a WordPress.org blog on my own domain, so WordPress.com was familiar territory, but there were some kinks (notably with Publicize) to iron out with two of us as admins (yes, we went against that recommendation). Once that was done, all is running smoothly. Very timely! I’m about to try to set up 1 “uber-blog” to combine the strengths and writing talents of 5 related wordpress.com blogs. We hope to use custom menus to show posts in 5 categories, corresponding to the 5 previously separate blogs. Bit of a challenge trying to figure out if we can move any content from the 5 separate blogs to the new single blog, and I’m struggling to know what to do about re-directs from the old blogs (we want to re-direct multiple wordpress.com blogs to this new wordpress.com blog, not an outside provider/domain). I’ll ask on the support forum, but some guidelines on combining blogs would be useful, particularly given the way some of the new premium themes allow you to highlight different types/categories of content. Yes, please do ask specific questions about the most effective ways to use categories for specific themes in the support forum. I’ll take note of your interest in learning how to showcase different categories/types of content — perhaps in the future we can provide showcases or tutorials focusing on specific features of a theme. This is cool and very inspiring. But this is nothing new, I have done this as a photoblog since 2006 with a friend. But it would be fun to se more multiuser blogs. Cool and thanks for the post! Group blogging is a great idea.. it helps you connect with your friends and associates better.. I love the idea of a guest contributor, you could make it a monthly thing and have a different guest every month! I am part of a group blog – busfullofyarn – that we just launched in late July. It is wonderful because we are in the learning phase, but we are really having a lot of fun. We have two administrators, 5 editors (probably too many) and 1 contributor. We are all trying to find our voice and figure how this works, but it is so much more fun together! Group blogging is so fun and rewarding. My now defunct group blog (RIP: I Fry Mine in Butter) had a diverse set of voices writing about pop culture, life and cop show tropes. it was both a challenging model and also one that fostered tremendous creativity. And then of course, the lovely WordPress peeps thrice chose I Fry Mine in Butter for the coveted Fresh Pressed, which THRILLED US TO NO END. So yeah, group blogging is awesome. For a beginner this has been a very easy set up, well appreciated.